MODE and colleagues from Great Ormond Street Hospital collaborated on a one day Agenda Setting Workshop on 7th April. 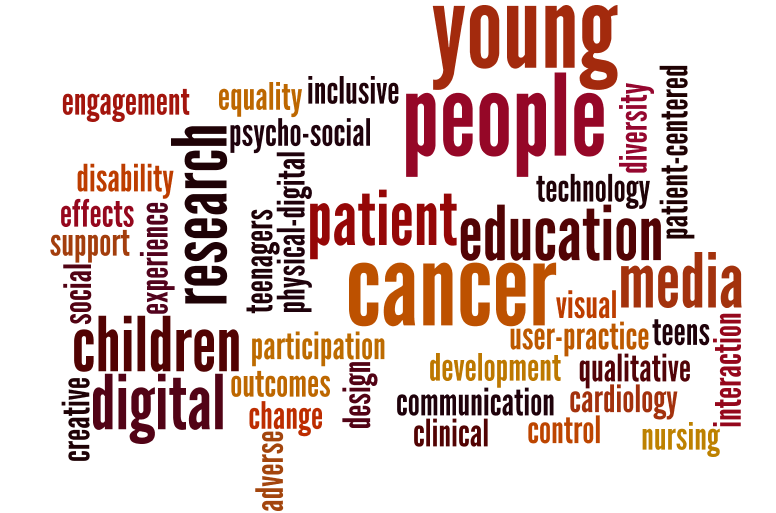 The day focused in on the potential of digital technologies to support patient-centred research – a growing area of interest within child and teenage cancer care: including ways of using digital image and video and photography, mobile technologies, social media, and tangible technologies. Participants presented their work in this area, showing the many pockets of innovative practitioner-focused projects in this area. The day brought together health care practitioners and researchers working with children and young people from charities and the NHS, together with researchers from within the arts, and social sciences to share methods for using digital technologies, identify key themes, discuss key challenges, explore interdisciplinary synergies, and identify directions for the agenda of future development of this area. This wordle visualises the three key words that participants used to describe their area of interest and work. There was recognition of the role of technology in contemporary health practice, with tele-medicine, NHS Health App Library, and many examples of what technology is used to do already. Participants each gave a short presentation of their work to enable the group to capture the diversity of projects, methods, perspectives and ideas. This included a variety of projects where digital technologies – web based systems, PDAs, tablets and mobile apps have been used to generate data to support patients dealing with diagnosis, holistic needs assessment, symptom management and to facilitate peer support, as well as to explore patient well being and experience more generally. While blogs and podcasts have been used within some projects, there was recognition that there are areas of experience that are not currently using digital media that could be. Notably, there is a desire to make more use of the potentials of social media as a tool and rich source of data through which to engage with young people’s voices and experiences and to understand how to use technology better to facilitate patient participation and recruitment to research. A range of innovative visual and multimodal methods were discussed including visual diaries, digital scrap books, video narratives, and visual interviewing techniques. This gave rise to many other issues about the need to balance ‘off the shelf technologies’ with the constant development of ‘bespoke’ digital solutions, and the need to understand what practitioners and families want. The strong potential of technology to serve as a bridge between people and spaces (notably home, school, and hospital) was discussed. The need to get the health profession to embrace technology was a constant point of discussion, as the potential of the digital to better support listening to patients and practitioners stories.